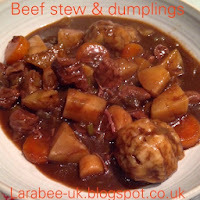 Oooh I do love a good stew! I thought I'd share with you my recipe for a simple slow cooker beef stew this week, although you could cook it in the oven if you prefer. 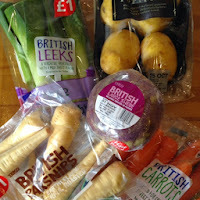 This is a simple, cheap dish which is great for families and if you take into account the fact that you basically throw it all into a slow cooker, the prep is pretty quick too! 2. Switch your slow cooker on to HIGH. 3. Add your meat and veg to the slow cooker. 4. Pour over your stock. 5. Preferably after 2 1/2 hours remove any foam that has started to form on the top of the pot, this is not necessary but does make for a better taste. 6. Cook for 5 hours. 7. 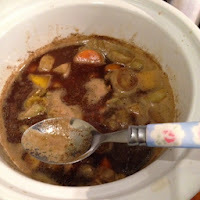 Mix the cornflour with a little water and pour into the pot, stir thoroughly, the gravy should then start to thicken. 8. 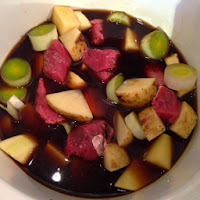 Mix the dumpling ingredients together and form 8 balls, place in the pot and cook for a further hour. 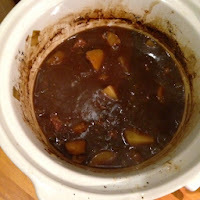 I never brown my beef, but I know some people like to, if you want to do that brown your meat in a frying pan before adding to the slow cooker. If you are using fresh, good quality produce there should be no reason to peel your carrots and potatoes, just give them a good scrub before chopping! Can be frozen once cooked. Throw in a glass of red wine for a richer flavour. Add herbs to your dumplings. Cut out the potatoes and serve with creamy mash. Leave out the beef and use vegetable stock cubes for a delicious vegetarian version.